Colorful fabric quilt artistic creations are inspired by a love of nature. The exhibit hangs in the Lakewood Foyer Gallery through Nov. 11. The Lakewood Center Gallery is showing "Threads on the Edge," an exhibit of quilts created by Marjorie Post, through Nov. 11 at the Lakewood Center for the Arts, 368 S. State St. in Lake Oswego. version into an art quilt design. "I am looking for perspective, depth, mood and tones already present," she says. "The most enjoyable part of my process is the choosing of colors and textures in my vision and creating a vivid and colorful landscape." What often begins as a monotone photograph becomes an explosion of color and pattern in Post's work. She uses a variety of fabrics, such as silk, cotton, linen, canvas and denim from old jeans. These are then hand-altered using Procion dyes, or hand dyed using dye colors mixed and created to match the color palette required for the project. 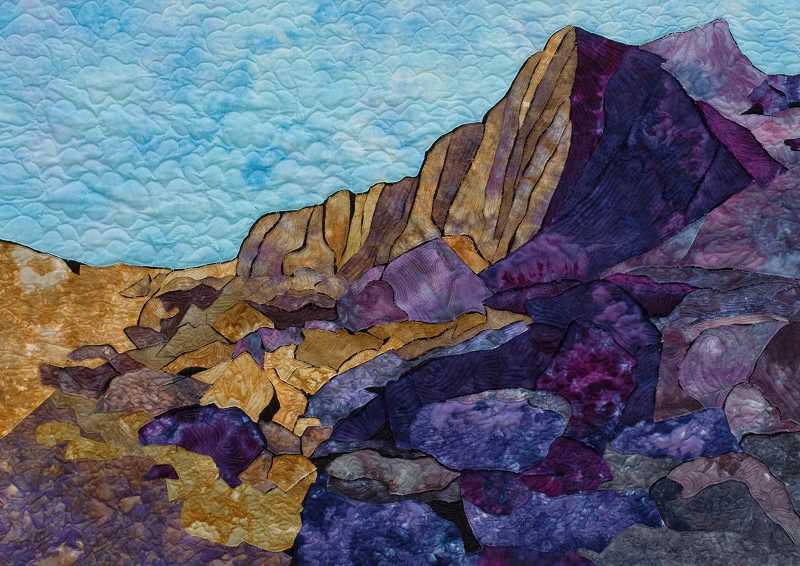 "I use a rough, raw-edge method of stitching and quilting to promote a vivid, natural effect," she says. "The excitement of the process is similar to that of solving a beautiful puzzle." Post's work has been juried into national and international shows, published in books by Northlight, Lark, Rockport and Quarto and printed in Vogue and American Quilter magazines. She has been a featured artist in the Northwest Quilt Show, the prestigious Northwest Expo and exhibits in museums and quilt show from Tennessee to Seattle. She has spent many hours sharing her quilting skills with the women in the Coffee Creek Correctional Facility, and has donated more than a dozen quilts to the Community Warehouse and Northwest Medical Team fundraising auctions. Learn more online at thedragonflystudio.com.